The list of ingredients we can add to a salad is endless… here at Bondi we base our salads on lettuce leaves, fresh herbs and then seasonal additions. 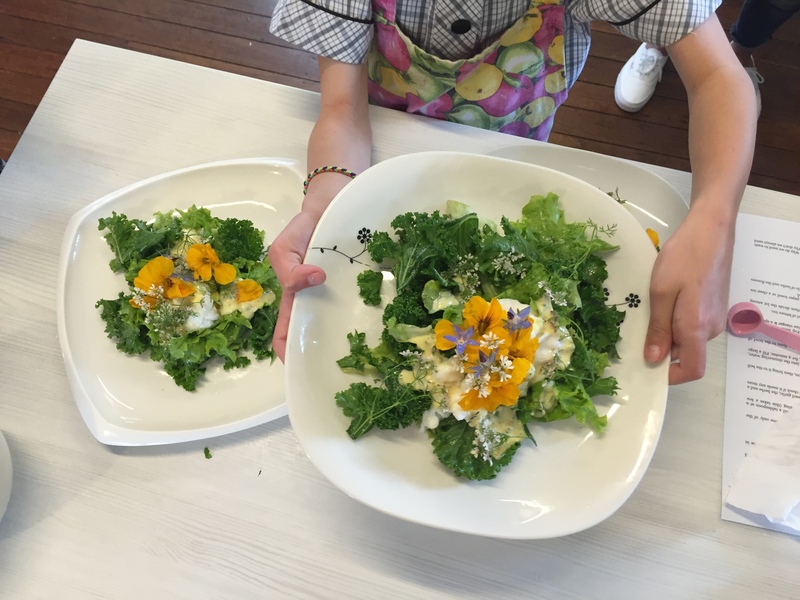 This one is a favourite with just-poached eggs and a wonderfully creamy and tangy dressing, but the key is to show the children how to handle delicate lettuce leaves without crushing or bruising them (the lettuce, not the kids…) and the gentle art of cracking an egg without destroying the yolk! Fill up the 2 big bowls with cold water & wash the salad leaves in several changes of water. Spin the leaves dry and wipe the bowls dry. Lay out the tea towel and line it with kitchen paper. Spread the salad leaves over the paper and roll the whole lot up like a log. Keep the rolled parcel of leaves in the fridge until needed. Reserve the small garnishing leaves and flowers in a separate little bowl of cold water. Wash the kale and shake dry. Snip the leaves from the stalks and discard the stalks. Spin dry thoroughly, then put in a clean dry bowl, drizzle a little olive oil and a pinch of salt, and then massage the salty oil into the leaves with your fingers for 5 minutes. Fill up another bowl with water and wash the herbs. Spin the herbs dry and pick leaves, reserving in their own small bowl, discarding stalks into compost. Scrub the radishes and then finely slice using a sharp knife or a mandoline slicer. Meanwhile for the mayo, wash the herbs in a few changes of water, spin them dry and finely strip off leaves from the stalks (coriander stalks you can leave in). Cut the lemon in half and juice the halves. You will need 2 tablespoons lemon juice in total. Smash the garlic clove, peel it and squeeze it through the garlic press. Carefully separate the eggs and reserve the yolks in a small bowl. Into the stick blender cup add the egg yolks, the mustard and 2 teaspoons only of the lemon juice. Whizz together until all is combined. Measure the rice bran oil, then get a friend to help measure in the oil a tablespoon at a time every 30 seconds into the egg mixture while you are whizzing (this takes a few minutes so don’t rush it). Then slowly add in another 2 teaspoons of lemon juice, the pressed garlic, the herbs and a good sprinkle of salt and pepper. Blend until smooth. Taste and check if it needs any more lemon juice or salt and adjust if needed. Fill the deep-sided frying pan with water to a depth of about 10cm, then bring it to the boil and then turn down to a bare simmer. Then break the eggs into separate little bowls, then slide them into the simmering water, one at a time until they’re all in, and let them cook, uncovered, for 4 minutes. Fill a large bowl with cold water. Then use a draining spoon to lift them from the water and transfer them to the bowl of cold water if you’re not ready to use them just yet. Strip the kale leaves into smaller pieces and add them to the separate bowl. Drizzle over a little olive oil and pinch of flaked salt and then using your fingertips, rub it all in to the kale leaves to make them soft. Take the lettuce from the fridge and chop into smaller strips. Pop them into a big bowl, then drizzle about a teaspoon of olive oil, a teaspoon of white wine vinegar & a sprinkle of flaked salt over the whole lot. 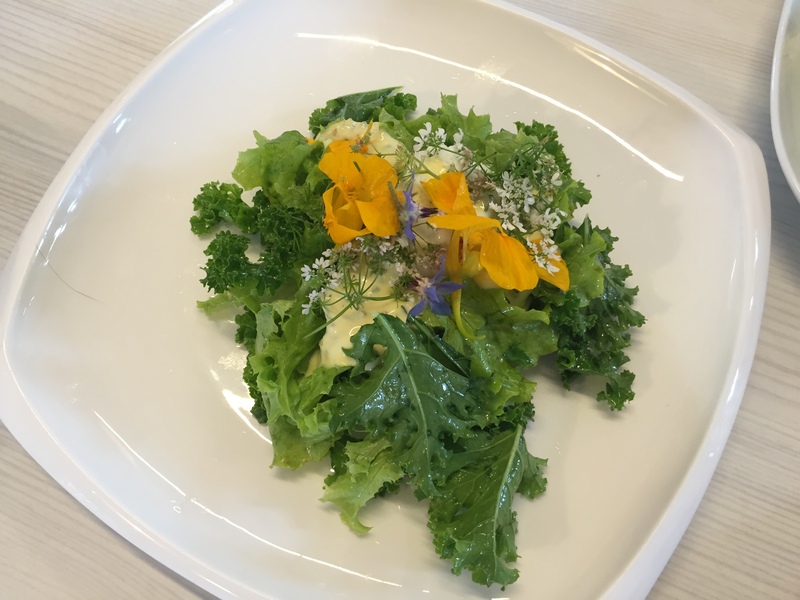 Add the kale into the lettuce and using your hands, turn the leaves to coat in the dressing and then divide the lot among your serving bowls. Spoon an egg at a time out of the water and dry off with some paper towel or a clean tea towel, and then carefully arrange one egg on the top of each salad. Drizzle the mayo over the top of each salad, followed by a sprinkle of herbs and the flowers and serve immediately! Notes: What is mayo short for? What other salad dressings could you use? Why do we need to wash the leaves so well? Why do we roll the leaves up to put them in the fridge? Why don’t we always need to use vinegar to poach the eggs? Why do we put the eggs into cold water?